Cosmology is at its heart a historical science: We are trying to reconstruct the history of our Universe from fossils we manage to recover. We use the known laws of physics to interpret those fossils but we are forced to speculate about extensions to the laws we have tested in the laboratory when the fossils we find are extremely old. The goal of my talk today is to discuss the status of our quest to reconstruct this history and report on what we might expect to learn from the next generation of cosmological observations. There is no registration fee or application form, and everyone is welcome to participate. 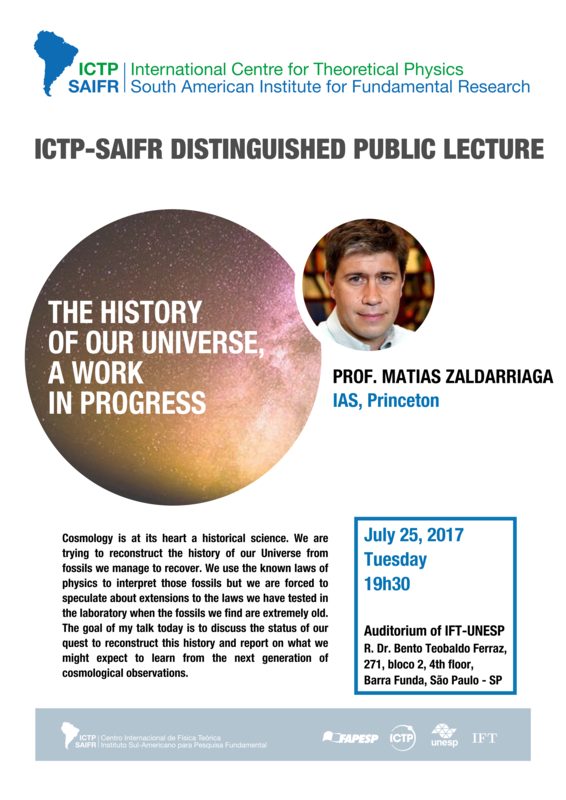 Matias Zaldarriaga is an Argentinian cosmologist working at the Institute of Advanced Studies (IAS-Princeton, IAS) and member of ICTP-SAIFR Scientific Council. Matias Zaldarriaga has made many influential and creative contributions to our understanding of the early universe, particle astrophysics, and cosmology as a probe of fundamental physics. Much of his work centers on understanding the clues about the earliest moments of our universe encoded in the Cosmic Microwave Background, the faint glow of radiation generated by the Big Bang, and in the distribution of matter in the late universe. The main purpose of ICTP-SAIFR public lectures is to bring outstanding international scientists to discuss and inform the general public about recent physics discoveries. Following the success of the ICTP-SAIFR Symposium Public Lectures, ICTP-SAIFR will be regularly organizing distinguished public lectures in the Auditorium of IFT-UNESP. For more information, send email to secretary@ictp-saifr.org .